When we went to San Francisco, Ry kept walking by the churros stands begging to have one. I told him to go ahead and he never did, so when I saw cheater churros on Pinterest, I had to pin them. 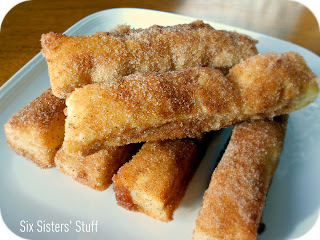 So, if you haven't guessed it, today's Pin Attempt is Baked Cinnamon Churros from the Six Sisters' Stuff. Preheat the oven to 450 degrees. Here in Canada, your puff pastry sheets need to be rolled out, or at least the ones I bought needed to be. I rolled them out so that it could be cut into 8 1-inch-wide strips... I'm thinking that wasn't enough because they didn't really puff. So, if you have experience with puff pastry, just make sure your strips are cut into 1 inch widths. From there, place the strips on a lightly greased waxed paper lined baking sheet. Bake them for 8 - 10 minute or until golden brown (mine took 12 minutes). Meanwhile, combine sugar and cinnamon, and melt the butter. 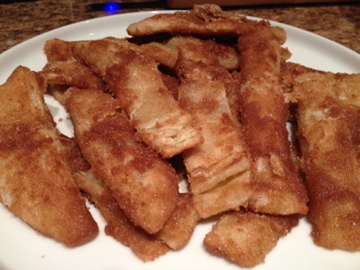 When the pastry is done, remove from the oven and dip in butter, then roll in cinnamon-sugar mixture. Let stand on wire rack 5 minutes or until dry.